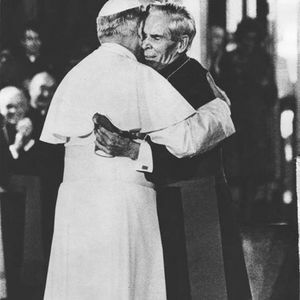 Archbishop Fulton J. Sheen speaks on &apos;Compassion and Human Life" and &apos;Communism and the Church&apos;. Al Smith the Pipe Padre. On today&apos;s program Archbishop Fulton J. Sheen speaks about &apos;Compassion for Human Life&apos;. He will also continue his 50 part catechism series teaching us the faith. His talk will be entitled &apos;Communism and the Church&apos;. May I encourage you to visit our web site at http://www.bishopsheentoday.com/ There you will find over 300 audio talks given by the Venerable Sheen. There are dozens of youtube videos for your viewing enjoyment. God Love You.